easyBus offer airport transfer bus services between the North and South Terminals of Gatwick Airport, Fulham Road and London Park Royal from only £4 one-way when you book in advance. Please Note: The Gatwick Airport to London’s Fulham Road bus transfer route is operated by easyBus. Pick-up and Drop off Location details can be found on your ticket. 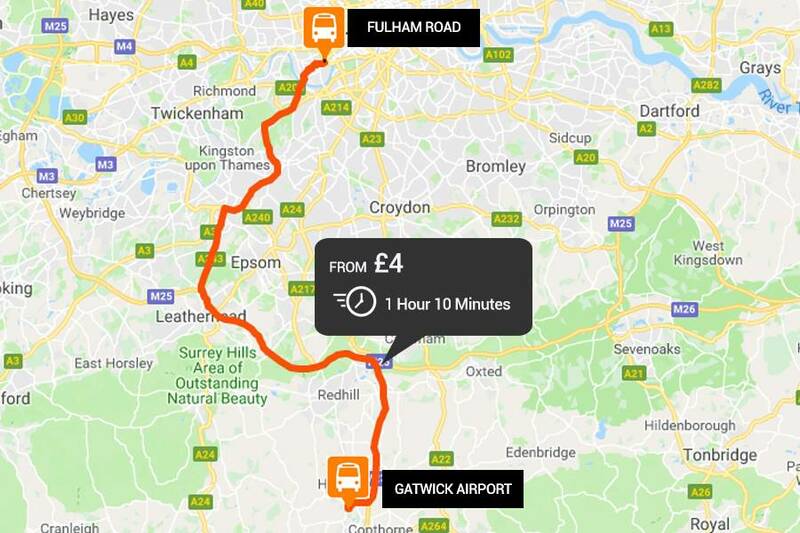 For passengers travelling to Gatwick Airport, easyBus recommends that you arrive at the airport at least 2 hours ahead of your scheduled departure of your flight. When travelling from the airport, easyBus recommends booking a service at least 60 minutes after the scheduled arrival time of your flight. Don’t worry, if your flight arrives early or late, you may use the same ticket at no extra cost to travel on the next available departing bus, up to 60 minutes either side of your booked time. Please note we cannot guarantee there will be spare seats, since passengers travelling on their booked service have priority.